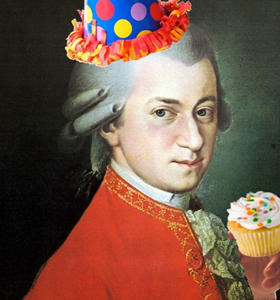 Join the San Francisco Chamber Orchestra All-Stars tonight for their annual Mozart Birthday Celebration! Robin Sharp and Debra Fong (violin), Sharon Wei and Ben Simon (viola), and Robert Howard (cello) perform a glorious program of two of Wolfie's most beautiful chamber works, Viola Quintet in B-flat Major, K. 174, and Viola Quintet in D Major, K. 593. Join us for this gala event, have a try at our Mozart Trivia Quiz, compete for the best period costume award, and enjoy a slice of free birthday cake!